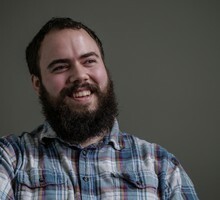 Bryan M. Vance is a daily digital producer at Oregon Public Broadcasting. Previously, Bryan was a digital producer for The Greenville News in South Carolina and The Asheville Citizen-Times in North Carolina. He also worked with Vox Media's SB Nation in a variety of roles for several years. Bryan graduated from Ohio University with a degree in journalism and a degree in electronic media production. When he's not at work, Bryan is spending time with his dog, Thor, and taking photos or cooking. What are the images that define 2018 in for the Northwest? We look back at some of OPB's best photos of the past year. In 1933, with its only bank closed and the country in the midst of the Great Depression, the Oregon shipbuilding and timber city of North Bend turned to a local resource to keep its economy afloat. Though Monday starts out below freezing, the National Weather Service forecast for the day calls for mostly sunny skies with highs in the upper 30s. In front of a packed house, OPB's daily talk show, "Think Out Loud," kicked off its series of events celebrating the show's 10-year-anniversary at Portland's Alberta Rose Theatre Thursday night. With California joining the growing list of states with legalized recreational cannabis in 2018, let's break down the differences in how West Coast states regulate their industries. If you're new to the recreational cannabis game, you may be overwhelmed by the idea of extracts and concentrates. Here's a guide to make sense of the different terms and products available. The Eagle Creek Fire remains the nation's top firefighting priority and is burning more than 33,000 acres in Oregon's Columbia River Gorge. The human-caused Eagle Creek Fire, which exploded in growth Monday evening and jumped the Columbia River Gorge early Tuesday, continues to grow. With wildfire smoke in the air around Oregon, the state Department of Environmental Quality and public health officials are urging residents to take precautions. Fire officials confirmed Tuesday morning that the growing Eagle Creek Fire jumped the Columbia River Gorge. Interstate 84 from Troutdale to Hood River remains closed. With temperatures soaring and wildfires blazing along the Columbia River Gorge, many area districts announced closures or early dismissals on Tuesday. The Columbia River Gorge town of Cascade Locks is under evacuation notices due to the nearby Eagle Creek Fire, which is just 1/2 mile away. On Sunday, crews rescued hikers stranded in the Gorge overnight. A few hundred people gathered at the steps of Portland City Hall Sunday evening for a vigil and rally in response to the events in Charlottesville, Virginia.